Ray, is this also for the OSBo? Unforuntately not. 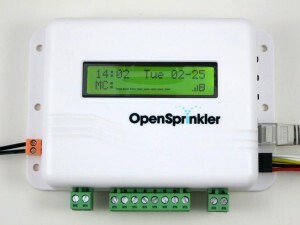 This is for the microcontroller-based OpenSprinkler, it’s not compatible with OSBo and OSPi. Maybe you could add the ESP8266 module for easy WiFi connectivity. See this site (https://nurdspace.nl/ESP8266) for details about this new module … found from HackADay. I hope you will publish detailed instructions for hosting the Python scripts and everything else “cloud”. If, for whatever reason opensprinkler.com won’t be available (now or in unforeseeable future), I don’t want my controlled stops working. This is the primary reason I’d personally stay with the old firmware (mine is 2.0.7), besides disliking the new UI. I need to have multiple masters or an “and” function. But can’t just use a single master. You should update to firmware 2.1.2 — it supports per-station ‘sequential’ flag. For each master station you have, just set its sequential flag off, and then assign it in a program with other stations. This will allow you to achieve multiple master stations. I’ve replaced my Hunter X-Core irrigation controller and it works like a charm. I do miss the benefits I had with the Hunter Solar-Sync sensor which in addition to being a rain sensor, is also an evapotranspiration (ET) sensor which is send to the controller after every 24 hours to globally adjust the run-times up or down, based the water lost from the soil. The Hunter Solar Sync sensor still only connects with two wires, so I’m guessing some sort of serial message from the sensor is pulsed to provide an adjustment of 10%-150% of the configured run-times. Any ideas on how we can incorporate this into open sprinkler? I’d be happy to help in anyway I can (I’m not an electronics savvy person though). That’s a very interesting thought. I’m aware of the Solar Sync sensor but I’ve never thought about reverse engineering it. Now that you’ve mentioned it I think I will get one to try it out. I do see that there is the sensor itself (which can be used with some of the advanced controllers), and a module which can be used with controllers that don’t have built-in support for the sensor. I am wondering if it would be possible to use this with any controller — not very likely but maybe the module is cleverly using the rain sensor port as a way to turn stations on and off in some sort of PWM fashion to simulate the calculated ET watering percentage. I quite like where you are going with a possible “universal-like” application, extending it to the OpenSprinkler as a general ET capable sensor. I happen to have the model that has the remote wireless sensor, and the wireless receiver that connects direct to the X-Core controller (as it apparently understands the Solar-Sync signal and does not need the additional “integration module”). I tried very clumsily with a likely flawed approach to see if I can “pick-up” any thing from the receiver module when I manually trigger the remote sensor. The receiver module only has two wires and I tried reading via the analog input on an Arduino Uno clone (which I setup as a type of poor-man’s oscilloscope for PWM signalling). I was unable to get anything from the receiver (no noise just a clean clear HI/LO), but I was only running the receiver over the 5v power line (it did power-up but it didn’t seem to successfully pair with the sensor). I’m not sure if I need to give the receiver a separate power source, higher voltage / current or even 24VAC like that used by the controller – I’m out of my depth here, so I don’t know how to proceed further really. And so one of my other thoughts pointed me towards the wireless sensor unit – thinking that if the receiver does some sort of clever encoding/decoding, perhaps I could glean some insight from the likely RF signal (transmitted from the sensor unit directly). This could be a natural extension as to whether your clever RFToy would be suited to try and figure it out, something along the lines of hooking it up to the sound card and following your related posts about reverse engineering a signal? I don’t have one, so I’ll have to order one to Australia first. I’m making assumptions here and I don’t even now if the sensor is using 433Mhz. I’m sure you have other things you’re more interested in, but please do let me know if you make any progress in this area. So I just received a SolarSync sensor with module yesterday and I’ve started checking the signals. I have some basic findings: first, there are three wires that go back to the main controller: the orange and yellow wires that go to the rain sensor port, and the blue wire that goes to the REM port (i.e. SmartPort). It looks pretty clear to me that the rain sensor wires are completely separate from the REM wire, and the watering percentage value that the module calculates is only transmitted through the REM wire. So that simplifies things a little bit. My understanding is that the REM port can also be used to hook up with a Hunter remote control module — so it must be using some kind of encoding scheme to send program signals through this port, and this would be something interesting to reverse engineer. What’s strange to me though, is that the blue wire actually carries 24VAC signal, not logic level signal. I am guessing this is done because the two circuits (main controller and solar sync module) do not share a ground wire. Therefore you can’t send logic level signals as that would require the two circuits to share a ground wire. In any case, I’ve make a little circuit hooked up with an Arduino to monitor the signal on the blue wire. It has been running for a few hours and I don’t see any actual signal yet. I guess the module sends data to the main controller very infrequently (maybe once a day)? So I will have to keep it running for a day or two to see if I can get something out of it. Hi Ray! Are you able to make any inroads with decoding the signal? On my end, progress has inched along. Received a RSToy v1.1 from a local Australian supplier earlier this week. I’ve managed to capture the RF signal from the SolarSync (WSS wireless model) Rain+ET Sensor unit. I’m half guessing that the signal combines the ET measurement as well as the RainSensor On/Off indication and so I’ve triggered the sensor with a ‘rain’ state and again with a ‘no-rain’ state in succession to try and ensure all other data (that makes up ET component) is remains the same and only the rain bit/bits flipped. Once in Audacity, I can see that the same “data packet” is repeated 10 times in a burst. Each of these 10 “data packets” are the same. What I’m struggling with is interpreting this wave protocol as binary bits. Not sure if it’s proprietary protocol, but it doesn’t seem encoded or anything that I can tell. Also, should I read anything into the fact that the signal seems to be on the negative biased relative to the y-axis? Thanks, all of this is fun! I have a wired sensor with a decoding module (http://www.amazon.com/Hunter-Solar-Sync-Rain-Sensor/dp/B0026Q8AHQ), so the signals I am looking at may be different with yours. I have not made much progress since my last reply. I am able to observe the data on the REM wire, which I believe carries the ‘watering percentage’ value that ranges from 0% to 300%. But I’ve set it up for several days and it’s giving me 10% all the time. Without any variations in the data I can’t reverse engineer the signal. The decoding module sends out one signal every day at midnight (12:00am) so I can manually change the time on the module to force it to resend a signal, but as I said it has never changed over the last few days. The other weird thing is that the signal on the REM wire is modulated by 24VAC (i.e. 50 to 60Hz carrier frequency), which is quite interesting. I am not sure why this is done. In any case, I am still pretty far from figuring it out. From the irrigation side I know that 10% is the minimum that the controller will adjust to. I would suggest you actually place the sensor in direct sunlight and also pour a little water over it to trigger the rain switch and then measure the evaporation along with the direct sun. Mine doesn’t seem to vary unless there is actual sunlight on it for a long time – maybe even up to a day. You may notice some condensation on the inside of the sensor dome too. Hope that helps.